A statistical analysis of the results makes it clear just how inadequate the original correlation was: it consistently under-estimates the FG, albeit not as much as in my own brewing. I assume that’s due to the average attenuation in the complete data set (62% RDF) being closer to the typical values assumed by the old correlation, as I noted in my first post on the subject. It is also noticeably less precise than even the relatively poor “triple scale” hydrometers used by most home brewers, let alone one designed for FG readings. Interestingly, the linear correlation is more accurate than the cubic, albeit slightly less precise. Both compare favorably to a consumer-grade hydrometer – which with perfect use could potentially be read to ±0.0005 SG. So it seems that – with the exception of very low-attenuating worts – either of the new correlations can provide accuracy and precision on par with the consumer-grade hydrometers typically used by home brewers. In a situation where a new correlation was being substituted for the old one, the cubic fit may be preferable since it only requires the coefficients to be altered. Otherwise, in my opinion, the linear fit provides wholly acceptable results. As always, though, your mileage may vary. In situations where the FG needs to be known precisely, testing with a properly calibrated precision hydrometer remains the best option. I’ve updated my FG prediction spreadsheet to version 3.0, which, in addition to the two new correlations, incorporates a more accurate Brix-to-OG conversion, and reverts the default “wort correction factor” to 1.04, which would seem to be more typical for the overall data set. Download links are below. Finally, I’d like to thank Dave, Enid, Gustav, James, Kai, and Scott for recording and sharing their data. I’ve (finally) written a PHP version of the basic FG calculation, so that people can use it without downloading the spreadsheet. This appears to be a wonderful tool, I’m a wine maker who has always used a hydrometer for measuring the OG and FG (with alcohol). I’ve recently purchased a refractometer hoping to become more acurate and refine my processes. The refractometer seems to have muddied the waters or caused my confussion. Will the formuals work with wine as well? My wine example, I have a FG with alcohol which reads 1.013 with my hydrometer, however my refractometer reads 11% Brix and when converted using other sites it put the FG at 1.004. Your numbers appear close to my actual numbers. Will they work with finished wine? Having not tested the correlation on any wines, I can’t give a definitive answer. I’ve heard that the “old” correlation was developed originally for vintners, but your attenuation level is closer to a typical beer. I’d guess that in that range the new correlation would give better results, but that it won’t work as well for dry wines. Hope that helps. I understand that the worth correction factor is compensating for the content of higher sugars (not fermentable)which will be included in the Brix (and hydrometer) measurement. Since the amount of such sugars depend on the quantity of special malts (and to some extent to the type of yeast used)it would seem that the correction should vary from beer to beer. As the final Brix/gravity (corrected for alcohol) is a measure of remaining extract it seems that it can be used to recalculate a worth correction factor. I.e. an iterative procedure? In order to calculate attenuation through refractometer readings in a daily basis – that is, to monitore fermentation – what do you recommend? 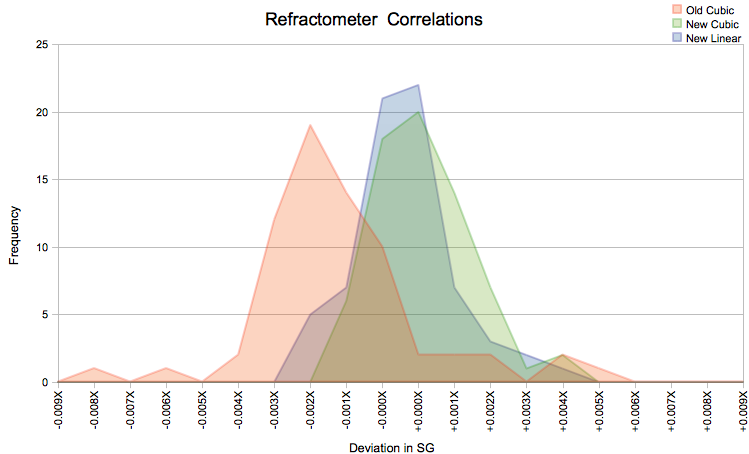 Are there any equations that can be applied to low attenuated worts that could perform a good correction for refractometer readings? Or hydrometer readings would be the only option available on this? I used this with a predominantly molasses wash which has other problems due to nonfermentable solids. The numbers using Sean’s math are surprisingly close to the measured OG,SG and ABV done with a hydrometer, and the ABV is in very close agreement to the calculated ABV from the amount of fermentable sugars in the wash and also to measured yield from previous identical washes. Thanks for all the hard work! This will give a nice second check to hydrometer readings in future washes. OK I read more of the comments, which I should have done first and may have found my answer. Reading is good kids. The twelve data points used to develop the correlation had OGs from 1.036 to 1.106, FGs from 1.007 to 1.022, and ADFs from 73% to 91%. As long as you stay in those ranges, the results should be fairly accurate. If one or more of them gets near the margins, though, you may get better results from a hydrometer. It all depends on what kind of precision you want/need. Just as an example, I recently brewed a Belgian Blonde with an OG of 1.041 and an FG of 1.005. The OG and ADF (88%) are both in range, but because they’re both near the margins the correlation didn’t give very accurate results (estimated FG was 1.009). I would guess that both of your beers would give good results, because the gravities are marginal but the attenuations are more typical. Again, it just depends on what you personally consider acceptable.